Welcome to Daisyking.com! My name is Dennis Baker. My family and I have a history of employment with Daisy going back to 1934. Between my father Sheldon, my brother David and myself, the Baker family has nearly 80 years of service with Daisy. Daisyking.com is intended to provide some basic information about Daisy and Markham / King collectible air rifles, air pistols, toy guns and accessories. Also, some of the duplicate items in my collection are for sale... here. 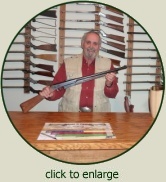 Rifles For Sale View collectible rifles that you may purchase. Pistols For Sale View collectible pistols that you may purchase. Toy Guns For Sale View collectible toy guns that you may purchase. Accessories For Sale View collectible accessories that you may purchase.